In the past, I’ve provided updates from the moment I seed, so obviously I have some catching up to do. Something I struggled with last year and again this year is figuring out the optimal time to start seeding (based on my previous successes and failures). It’s difficult to keep all the details straight in my memory. I only started keeping written notes in 2016, so it’s good that I’ve taken photos over the years for documentation. This year started off with less POW and excitement. I can’t pinpoint it, but I was going through some stuff earlier in the year. The long winter did not help. Originally I wasn’t even sure I wanted to have a productive garden this year. The previous few years I have put in time and care into my garden, only to go on vacation during the main harvesting time. It made no sense and I didn’t want to go through this again. After a few weeks of simply going through the motions of life, I pulled through and felt joyous again. I had come up with a plan, and I was ready to execute. One of the big decisions was not to grow as much from seed this year, including tomatoes. Growing things from seed is rewarding and truly fascinating, but it also means so much of my heart is invested. This can make gardening overly emotional as I become protective and want to see my plants thrive. I want to be there to witness their growth, from vertical to fruit formation, to laying them to rest at the end of the season. I still adore purchased plants, but I am slightly less fussy which makes gardening more relaxed. So step one was setting my goal of buying seedlings, and being ok with the decision. I decided to seed peppers. Unlike tomatoes, hot peppers don’t grow at the same rate. This means that they don’t get as lanky as quickly, and hardening them off is easier (less chances of stem breakage in the wind). Sweet peppers do grow upwards much more quickly than hot peppers, but I found a solution for that. As I mentioned, it’s been tricky figuring out the optimal time to start seeding. Last year, I think I started a little late (but the growing season also wasn’t great in terms of weather). 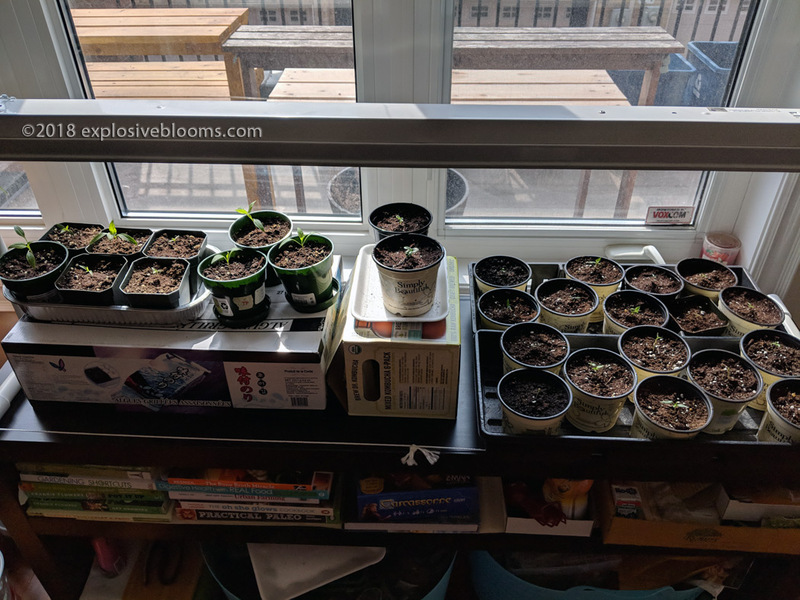 This year, I started seeding on March 17th. 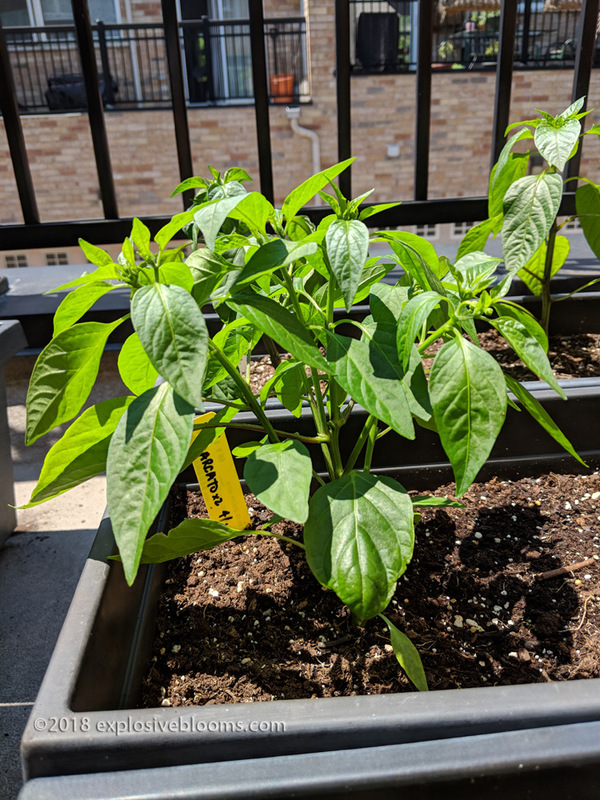 In retrospect, I should have started the hot peppers even earlier (note to self, start hot peppers mid-February in 2019). For sweet peppers (non-chili), I think mid-March was a good time. The below photo is of the pucks 11 days after seeding. As you can see, the shishito peppers (right) were one of the first to come up, followed by one espelette. These are not chili peppers. 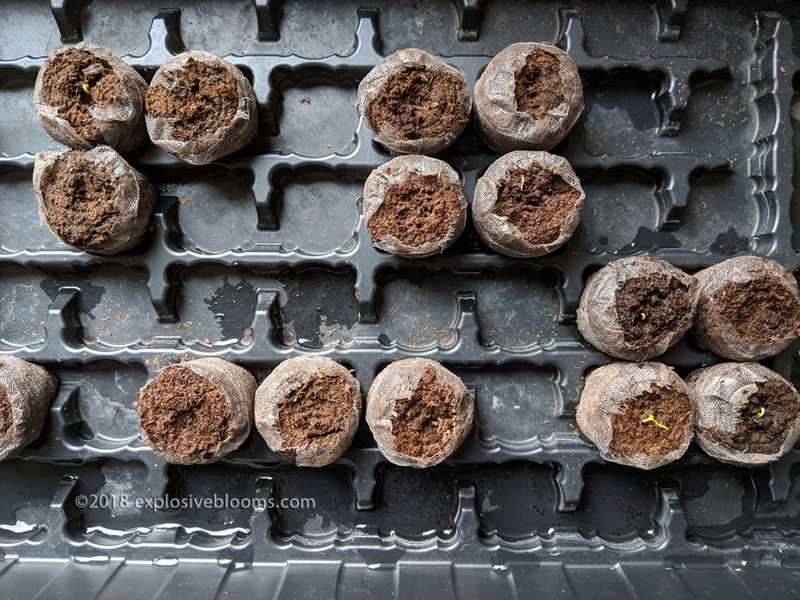 I have always waited until the plants have developed some true leaves before potting them, but this year I decided to start this process much earlier so that I could easily remove the perforated wrapper without damaging roots. 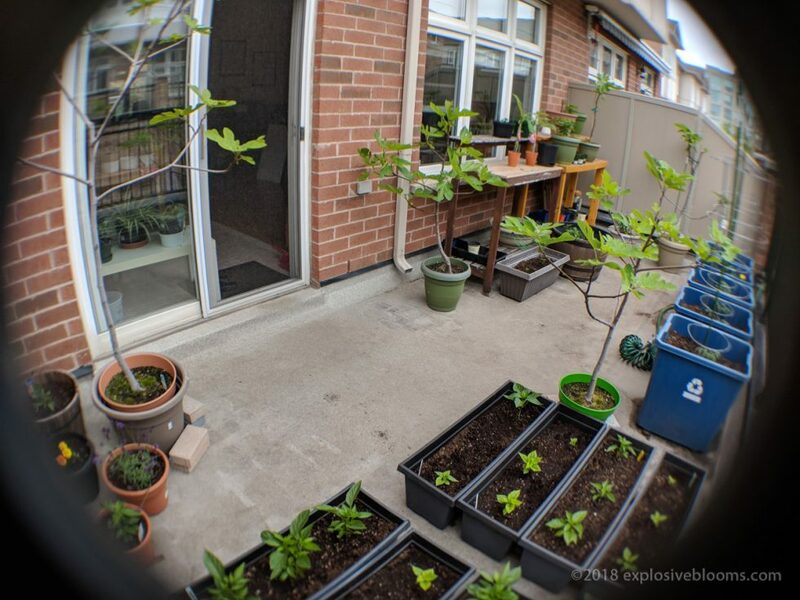 On March 30th, I started potting up, using a mixture of potting soil and worm castings from my bins. 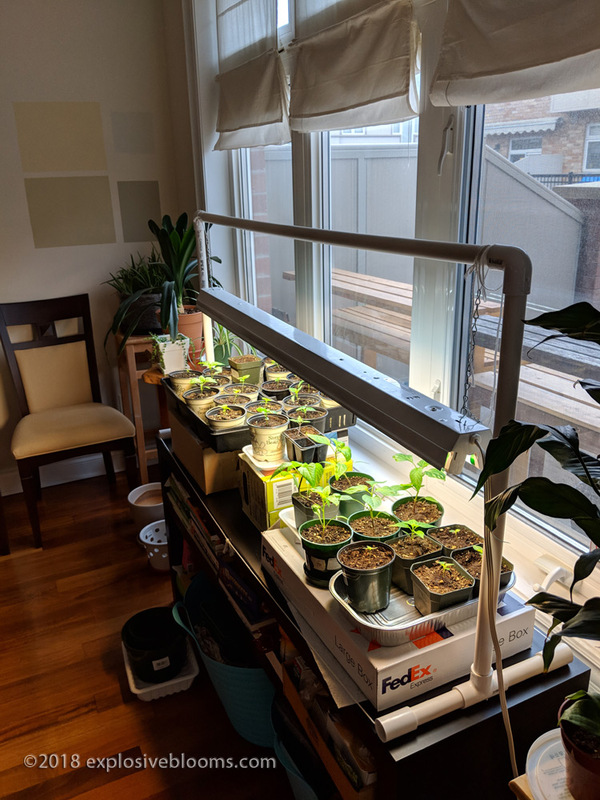 As soon as a number of the seedlings popped up, I set up the lights. They had been under the lights for at least a month, and for a significant period of time each day. I believe the timer was set for 2am until 12pm, and again from 5pm until 9pm. What I did with the non-chili peppers was I pinched off the tops, once there were at least 5-6 true leaves. The idea is that this will force the plant to grow off-shoots, which will create a bushier plant. This has definitely proven true for the shishito plants, but the espelette didn’t love this. It didn’t really develop any new branches. Yes, this seems scary at first, and especially as I’m holding a bunch of healthy plant tops in my hand, but I just took a deep breath and did it. Here is a photo of the plant today – as you can see, it’s not super tall, but it’s bushy. 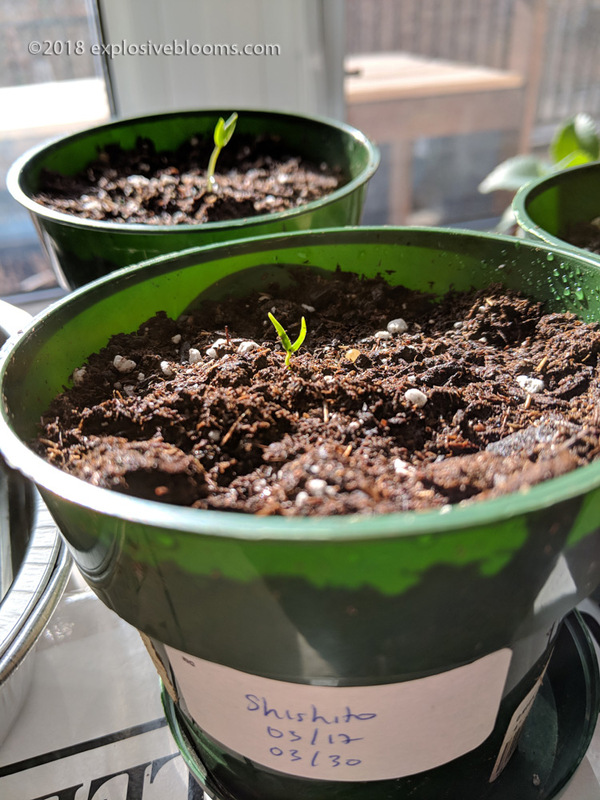 I did not do any pinching for my chili plants because they grow at a slower rate, and even today they are still quite small (hence, start them earlier). The tomatoes I purchased this year from Plant World include Sweet 100s, Old German, and Rapunzel. I should mention that last year I had purchased possibly the last Rapunzel, but the growing habit didn’t match the description I read online. But the flavour and texture was wonderful, so I saved some seeds. I stuck two of the seeds in some soil in early April and one of them germinated. My experience is that if you start tomatoes too early, they grow really tall, making them trickier to harden off as their stems are more susceptible to snap in the wind. This plant has been doing pretty good, especially now that it is transplanted outside. 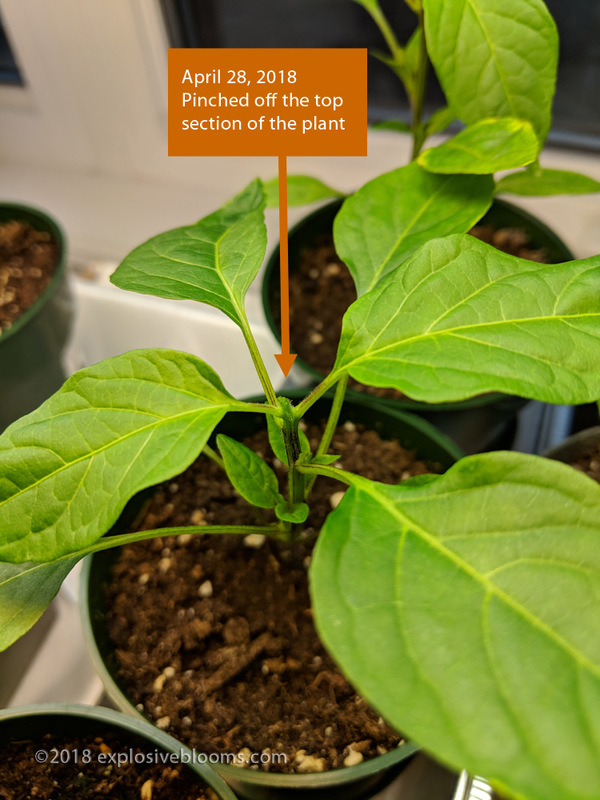 Prior to being in its final pot, it was showing signs of possible nutritional deficiencies, but the mottled looking leaves have turned green again. My plant from seed is not quite as dark green as the Rapunzel I purchased from the nursery, but it is most likely that the nursery plant has been provided with more fertilizer. Observation is part of the fun of gardening! And most importantly, we’ll have to see if the tomatoes look the same. 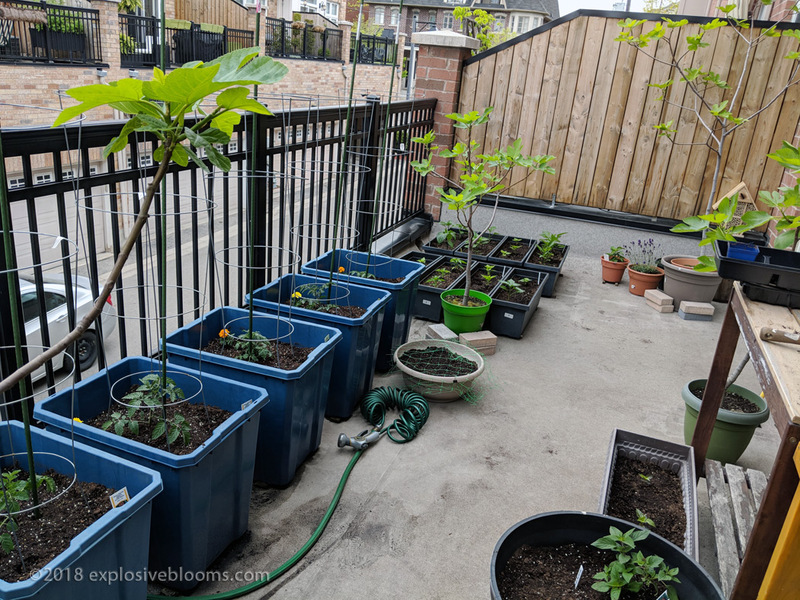 All the outdoor transplanting took place during the Victoria Day weekend (May 19-21), which is usually when I set up my garden each year. But my seedlings had been put out in the late afternoons starting in late April, and brought in (under the lights) at night. 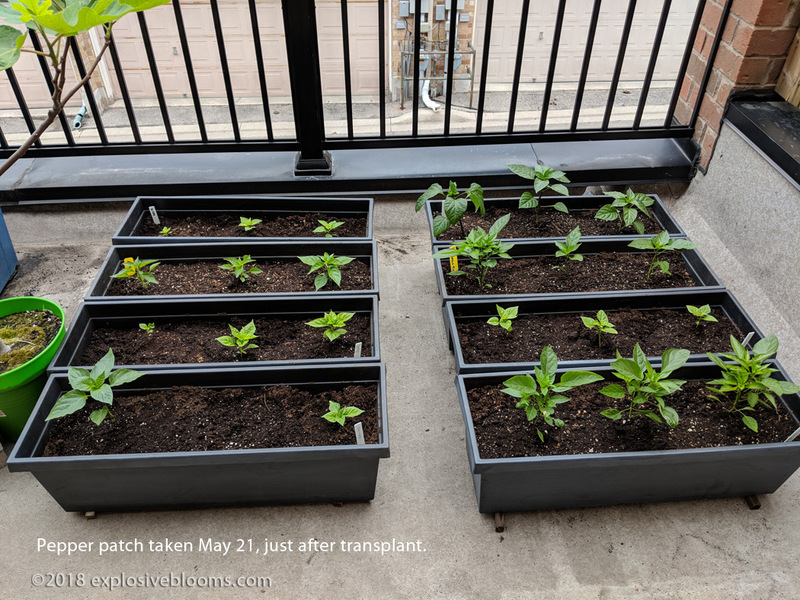 I believe I only left them out overnight a week or so before transplanting, when the temperatures starting to stay above freezing. I should mention that April was a weird month this year. On April 14th, we had a freak winter storm with ice pellets and freezing rain, and then on May 4th a wind storm blew through (damaging our roof). Hopefully we don’t get too many more weather surprises this year! 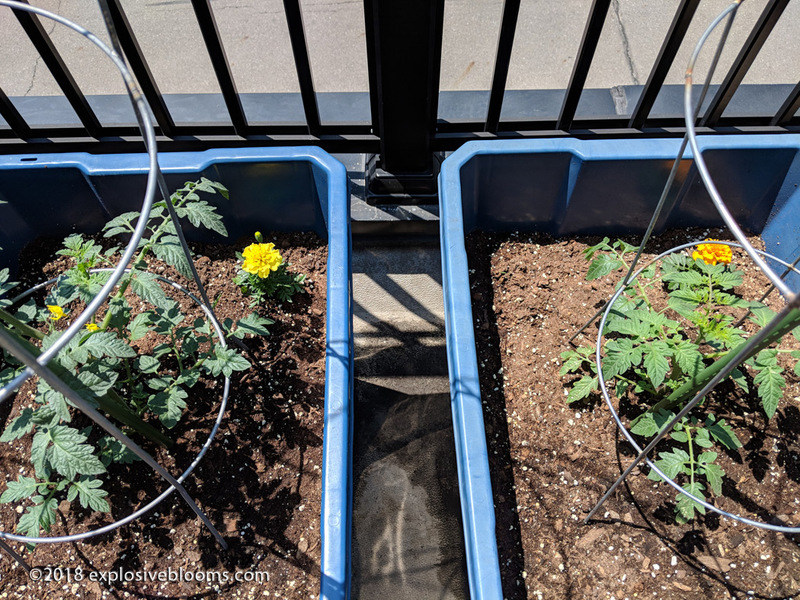 I purchased my tomato plants the weekend before Victoria Day long weekend, because last year when I went during the long weekend, I could only find the one rapunzel plant. This year there were plenty to choose from. I also purchased an orange habanero plant. 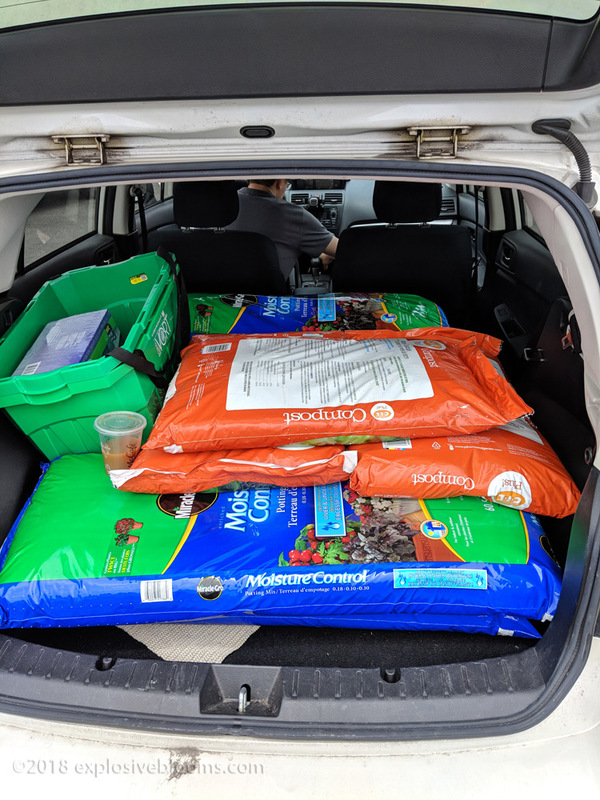 Soil was purchased on the long weekend from Costco. The 60.5L bags were on sale for $7.50 a bag – what a steal! I purchased 6 bags (139 litres), but I really only ended up needing 5 bags. This was to fill 9 pepper planting boxes, plus 60% of the five tomato planters, and filling random smaller pots for flowers. I mixed the potting soil with worm castings purchased from Canadian Tire (3 bags of CIL Plus! 28-pound bags) $6.50 each. This was the perfect amount for my garden. And this was pretty much all that we wanted to fit into our little wagon. This is my garden today. We’ve already ran the hose up, as this past week has been a scorcher with temperatures soaring into the upper 20s (celsius). 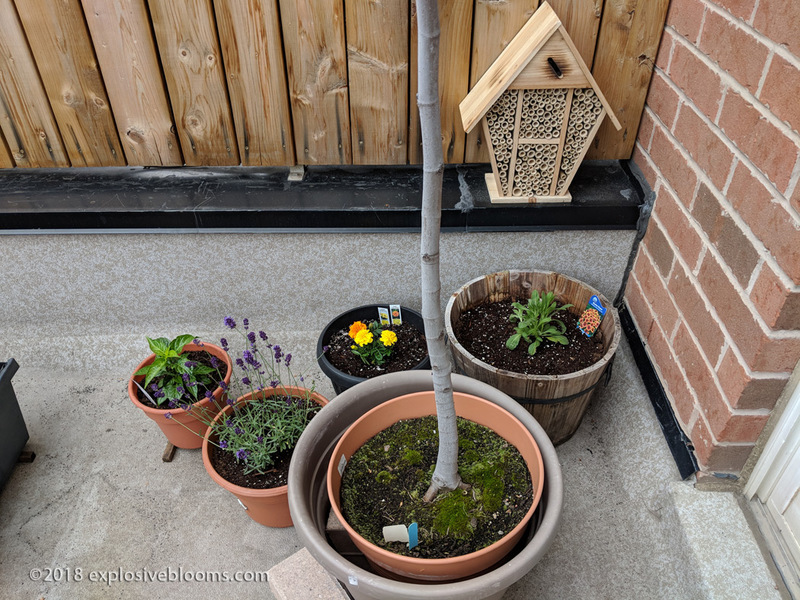 This year I have also purchased pollinator plants, such as lavender, allium, gaillardia, and phlox – all in hopes of attracting bees and solitary wasps. I had purchased a mason bee house earlier in the year from Costco (for under $20!). Hopefully this idea won’t come back and sting me by attracting aggressive wasps. I will do my best to keep my garden posts updated, including progress of our fig trees. We currently have five potted figs, with one cutting being rooted indoors. The only other things I’ve seeded during the transplant were basil, garlic chives, and slow-bolt cilantro. They were seeded in the same pot as the lemon thyme and pineapple sage plants I picked up. 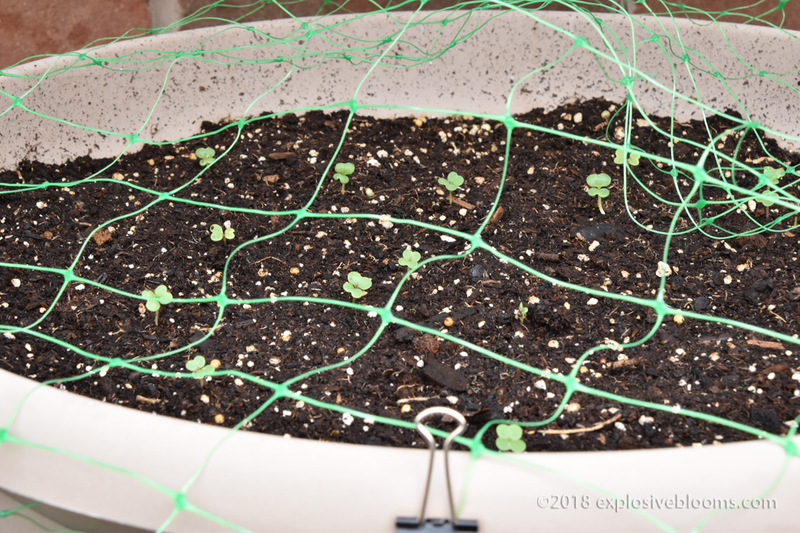 I also seeded some baby pak choy. That stuff germinates fast! I seeded on May 20/21 and they already popped up on May 25! I hope your garden is bringing you as much joy!